So, the training season 2016-2017 in Mumonkan Club has come to an end. It has been unusually fruitful and rich in bright events. Let us briefly summarize its main results. 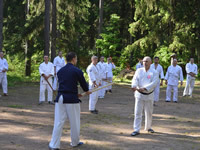 In December 2016, at the premises of our club, the first seminar in Minsk was held on Tenshin Shoden Katori Shinto-ryu under the guidance of Sergei Potapkov (Regional Development Director, member of the Technical Commission of the Eurasian Federation of Aikibudo and Katori Shinto-ryu, a member of Shibu Katori, the head coach of the Center of Martial arts, TSKSR 3 Dan). In December 2016 in Minsk we took part in a training and certification aikido-seminar under the guidance of the BFA chairman Andrey Mostovnikov. In February 2017 in Vitebsk an open lesson on aiki-jutsu (self-defense direction – Aiki-Jutsu Mumonkan) under the guidance of Vitaliy Goleshev was held for the representatives of the Sin Gan Dojo Martial Arts Club. In March 2017, an international training and certification seminar on aikido under the guidance of Makoto Ito was held in Minsk. Some representatives of Aikido Mumonkan Club took part in it and Alexander Zhin and Vyacheslav Agradnichevsky passed the 1 Dan examination in Aikido Aikikai. Alexey Popov, Maria Alexandrova and Sergei Aexandrov passed the 2 dan exam in Aikido Aikikai successfully. Our heartiest congratulations to them! On May 13, 2017, Mumonkan Aikido Club celebrated its 20th anniversary! On this occasion, a festive training was held, attended by our friends – representatives of Sin Gan Dojo Martial Arts Club (Vitebsk). On June 17 and 18, 2017 our representatives took part in an open seminar on Aikibudo and Tenshin Shoden Katori Shinto-ryu led by Ragimkhan Dadashev (Ranshi Aikibudo 5 Dan, TSKSR 3 Dan, President of the Moscow Federation of Aikibudo and Tenshin Shoden Katori Shinto-ryu). In the past training season, 16 of our students successfully passed qualification exams for obtaining various aikido ranks. We congratulate all those who have been certified and wish them further technical excellence! The club announces summer vacations for July and August 2017. We will inform you about the resumption of trainings on our site and in social networks. Follow the news! Welcome to our trainings in September 2017! The results of the training season 2015-2016.